Gold coloured vinyl with a 28 page art + lyric booklet. 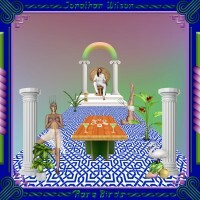 Andy says: Jonathan has eschewed the obvious Laurel Canyon trappings this time out, and the result is his best record yet. Still blissed-out, otherworldly, multi-layered and lonnnnng, but the sound is beautifully streamlined with even synths and drum machines gliding by. A headphone masterpiece.